Preheat oven to 375 degrees. Lay a large piece of heavy-duty foil on a baking sheet, and spray with nonstick spray. In a small bowl, combine chili sauce, soy sauce, and 2 tsp. water. Mix until uniform. Distribute broccoli onto the center of the foil. Top with salmon, and sprinkle with 1/4 tsp. garlic powder and 1/8 tsp. paprika. Drizzle with sauce mixture. 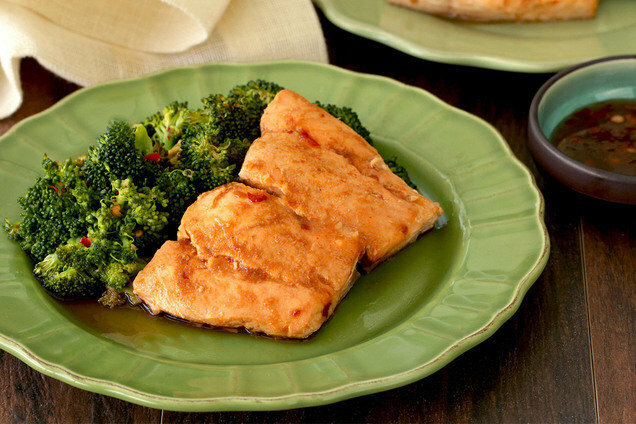 Bake for 20 minutes, or until salmon is cooked through and veggies are tender. Cut packet to release hot steam before opening entirely. Today (August 3rd) is National Watermelon Day. Have you tried our Spiked & Slushed Watermelonade cocktail? Summer in a glass! Click "Send to a Friend" to share this recipe with all the salmon lovers you know!